We are hearing rumors about SkyDrive improvements and possible desktop clients and paid plans for online storage. Today Microsoft confirmed the Metro style app for SkyDrive and detailed other features which are going to interest lot of folks. Microsoft Engineers Mike Torres and Omar Shahine detailed about the new features that are being rolled out to SkyDrive in a blogpost on Building Windows 8 blog. Together, this will bring a file cloud to every Metro style app, allowing you to open files in your SkyDrive and save them right back to your SkyDrive just like you would on your local hard drive. This will work with any app that supports open and save for documents and photos, and will be the first time anything like this has been possible without any setup or configuration. All you need to do is register your email address on a PC thatâ€™s running Windows 8 and then, whenever you save files on SkyDrive, every Windows 8 device you use will provide seamless access to those files. 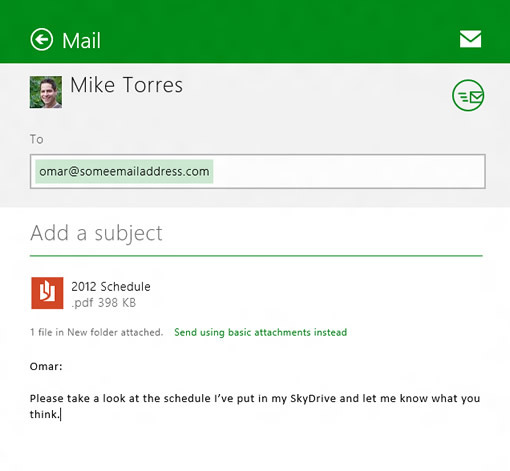 SkyDrive will also be available via the Share charm, which allows to send files through the mail app on Windows 8, you will be sending the files through SkyDrive instead of attachments. SkyDrive app will get drag and drop functionality, anywhere access to your data, offline access, and files and folders can be managed through Windows Explorer. The Desktop is a 5MB installer, that always keeps your SkyDrive in sync and up to date. The changes you make to the files are immediately synced to cloud and from cloud to desktop. The SkyDrive desktop app is not limited to the Windows 8 customers it will be available to both Windows Vista and Windows 7 users. We wrote earlier about the premium plans, looks like this is true as you can see in the video Mike Torres SkyDrive has 75GB of storage, this is not mentioned in the blog post but they said you can unlock more space online if you have used all your free space of 25GB. Another interesting feature is that you can upload files as large as 2Gb using the SkyDrive app. SkyDrive for the desktop will also provide the ability to sync up to your available quota of storage (and the ability to unlock more), along with unmatched performance on your PC. Oh, and we will also have support for uploading large files (up to 2GB) through Explorer, another big request from SkyDrive.com users over the years. Another feature that is detailed in today blog post is that you can use SkyDrive to fetch remote files using SkyDrive.com. The feature is called “Forgot something”, that is if you forget to put a file in SkyDrive you still can access that file remotely. Microsoft is using a two step authentication process for the security for accessing files. The remote fetch feature allows to stream video, browse files from remote PC. With all these features and additions SkyDrive will give a tough competition to the existing players like Dropbox and iCloud. SkyDrive app will be available through the Windows 8 consumer preview soon.